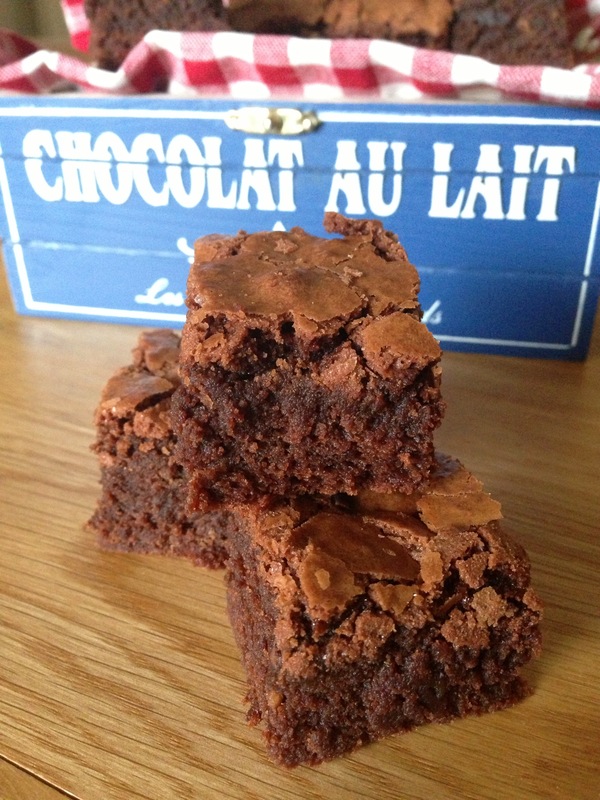 For Father’s Day this year, I decided to bake my dad a present – Amaretto brownies. Since I wasn’t going to see him on the Sunday, I gave them to him, freshly baked, on the Saturday. The plan was that he wouldn’t eat them until Father’s Day, but the temptation was too great and he couldn’t wait. He said he’d just have one, but after he’d eaten it, he decided one just wasn’t enough so had a second… after that my mum decided to ration them! I’ve tried several recipes trying to find the perfect brownie and so far the Green & Blacks recipe is an outright winner for me – its gooey in the middle and has a very thin crust on top. This recipe is pretty similar to the Green & Blacks one, with the addition of Amaretto, so they had a lovely “goo” in the middle. 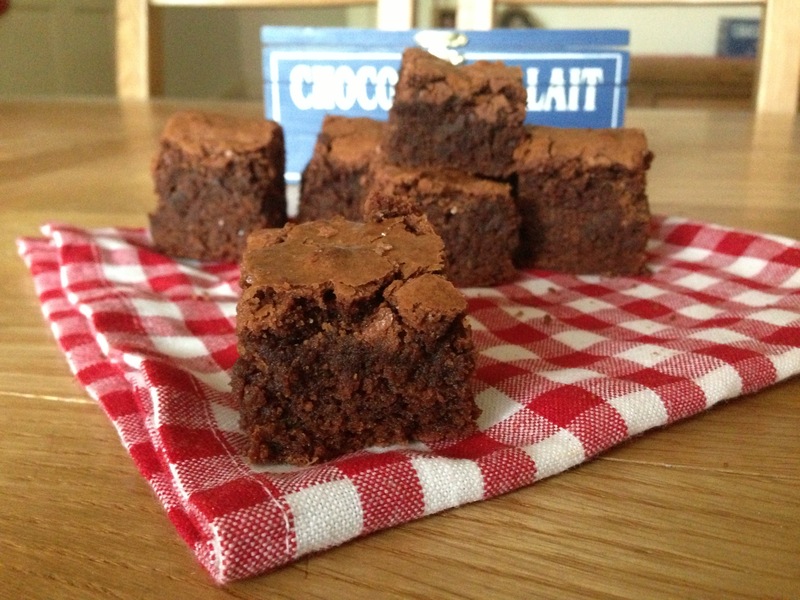 I’ve never thought of adding alcohol to brownies before but this worked well… so now I’m trying to think what flavour I can try next! Unfortunately for me, not all the brownies would fit into the bags I gave dad so I had to keep some for myself. They went perfectly with strawberries and cream…. 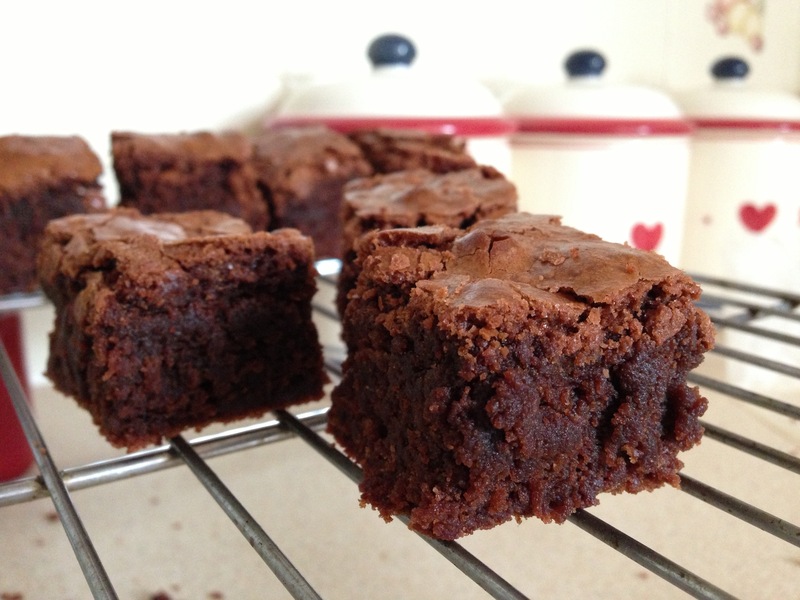 Line a 9×9″ tin with baking parchment paper and grease the paper with butter so the brownies don’t stick. Melt butter and chocolate in a microwave, stirring regularly until smooth and shiny. Leave to cool slightly. Sift together the flour, baking powder, and salt into a mixing bowl and set aside. Whisk together eggs, sugar and amaretto in a mixing bowl until thick and creamy. Pour in the chocolate mixture and continue to whisk until combined. Gradually add the flour mixture, and incorporate with a wooden spoon. Pour the batter into the tin and bake for 40 to 45 minutes or until a cake tester comes out clean when inserted into the middle of the pan. Leave to cool in the tin. Once cool, take the brownies out of the tin, remove the paper and cut into squares.